There is a whole class of cement that was very popular in the days before the invention and manufacture of Portland cement quickly replaced its use. Generally classified as magnesium-based cement, this material was used in historic times in Europe, India, and China, among other countries. It is unfortunate that Portland cement has replaced the use of these magnesium products because there are many ways in which they are superior. Primary among these is the fact that they require much less energy to produce and do not off-gas as much CO2 as Portland cement in their manufacture and actually reabsorb the CO2 as they cure. These cements develop considerably greater compressive and tension strengths compared to Portland cement. Another advantage of Magnesium-based cements are that they have a natural affinity for cellulose materials, such as plant fibers or wood chips; Portland cement repels cellulose. So you can actually use wood chips as an aggregate to achieve lighter weight and more insulative products. 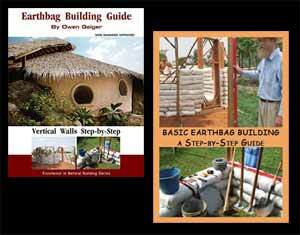 An example of this is what Michael Collins, an artist/visionary/eco-builder, has been creating with magnesium cements. Since these cements completely cure within hours of application, amazing sculptural forms can be created almost spontaneously and become usable within a day. Michael points out that a team of workers could build a small house in one day, and people could be living in it the next. While a bag of Magnesium cement might cost 2 to 3 times the same weight of Portland cement, that doesn’t mean that it is more costly to use. This is because with the attributes of the MgO cement, you can create very strong thin-shelled structures using a variety of lightweight and inexpensive fibers; something that ordinary Portland could never do. Because of these attributes, I think that magnesium based cement could prove to be very useful in conjunction with earthbag structures, either for roofs or as an exterior plaster, or both. Providing a water tight roof is always a challenge with any earthbag building design, and this can often be the most costly aspect of building. 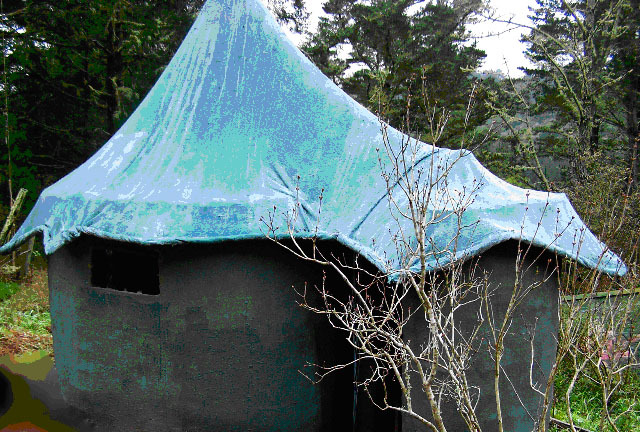 With magnesium cement, you can actually create a self-supporting roof within a few hours, just by draping burlap over an some temporary supports, and then saturating it with the wet cement. 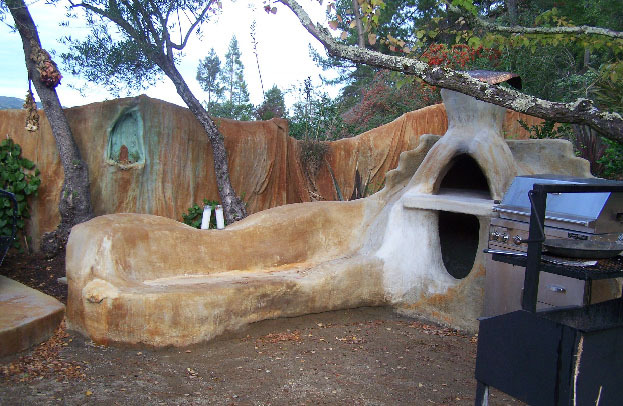 As a plaster, it would be very easy to drape burlap or other natural fibers over the bags, stretch and pin it tight, paint on the cement, and wait a few hours for a waterproof plaster. If this were done on a dome, you would have solved one of the most vexing problems of building earthbag domes: how to seal them from the weather! Michael Collins has described one simple method of building this way which is posted on his questions and answers column. If you have any questions about the possibilities of building with this amazing material, Michael is happy to answer them for you. Just go to the Ask the Experts page. And I have posted a longer article about Magnesium based cements at www.greenhomebuilding.com, that links to several companies that manufacture products based on it. Want to purchase magnesium oxide cement looking for a supplier in Texas. Please help thank you. Magnesium cement and basalt rebar seem like the perfect combination. Either that or geopolymer, which is available now in a few select places. Recently, I was looking for safe and nontoxic building materials because any materials that off-gas with VOCs or can cause allergies are strictly prohibited for the projects I’m working on. These are medical patient facilities. FYI I’ve found the solution with AinaCore insulation panels coated with Stuccomax and Plastermax. This blog tipped me to Stuccomax. I’m glad the blog has been archived. Thank you. What about the fact that it’s main draw back is its poor water resistance, beside cost?? It’s one more product, one more alternative to chose from. There’s no silver bullet that’s best for everything. StuccoMax is made out of Magnesium Oxide and would be perfect for the Haiti project. Please contact me for more info. Was wondering if this type of building works well in areas that are hot and humid in the summer, and freezing, cold and dry in the winter. Getting ready to start collecting wood and materials for a home, but are still fishing around for ideas. The burlap draped and cemented walls, fences. etc are things we have in mind. With cellulose added to the cement mix, would moss grow on the exterior surfaces, in shady areas? Getting moss to grow on the exterior retaining walls and fences would be wonderful! You’ll have to contact the author for details. Magnesium cement is not very common. It’s expensive and the mix must be just right. Hello, I’m interested in knowing how one can obtain a ready made dry powder mix of Magnesium Phosphate cement, one formulated with the right blend of Magnesium Oxide and Ammonium Phosphate that, when combined with a measured quantity of water, will yield concrete of high strength (8000 psi). Furthermore, to make the concrete, I’d like to know if one adds sandy soil or clayey soil to this mix ? Does the mix also require the addition of ash? If so, could one purchase a mix with ash already blended in at the right ratio ? Also, I want to add some form of cellulosic material such as wood chips, shredded straw, saw dust, paper pulp, ect. What are your thoughts on adding cellulosic materials ? Should they be added in addition to or in place of inorganic aggregates such as sand/clay/gravel ? What I intend to use this for is a roof and an exterior wall. I need a lightweight thin shell structure thats waterproof, insulating, sound dampening, mold proof, long lasting, can withstand occasional hail and foot traffic, and be able to breath out water vapor and moisture, and never rot. I also need it to be completely non toxic since I’m going to harvest the rain water collected from the roof for domestic water use. Therefore the finished concrete must not leach anything into the water, including salts. If the concrete made in this way has all these properties, then I’d also like to use it to build cisterns for storing rain water and for constructing tanks for an aquaponics system. It would really help the owner builder to be able to find and use this cement as easily as one can find and use portland cement. It would also free one from having to rely on the special formulations of contractors. It’s a little difficult finding detailed information on magnesium phosphate. You’ll have to track down Michael Collins and see if he knows. I have heard it is difficult to work with. If the formula is just a little off then it doesn’t work right. Mike, I would try it but they don’t sell it here. What about Haiti? I’m helping on a school project that wants to use canvas roofs. Is it easier and better to use magnesium cement or latex cement? George Nez is working in Haiti and can probably get us the latex. Ok, so maybe MgO cement is better for some applications. The problem is simple if you can’t buy the stuff there is little point in talking about it. So where can people obtain the MgO cement to try it out and see what it is good for. The link to the longer article lists a number of sources for this material, including http://gigacrete.com/ , http://bindancorp.com/ , and http://www.grancrete.net/ …all in the US. I’d love to know more… esp. re chrysacola… original sources? any further info/links greatly appreciated! This building method has massive potential and I would really love to see it catch on. One problem though is the lack of detailed information. (That, and finding the supplies in remote areas.) Someone needs to thoroughly research this and provide in-depth content so people can use it. I love this idea. Thanks so much, I had never heard of magnesium cement until now.